Student playing IBM's new "serious" video game, Innov8. Starting Tuesday, thousands of universities around the world have free access to IBM's video game in an effort to help students develop business skills. Following my prior post Serious Games For Improving Business Process Management, IBM today introduced a new video game designed to help university students and young professionals develop a combination of business and information technology (IT) skills. Thousands of universities around the world now have access to Innov8, IBM’s new “serious game,” available at no charge. More than thirty colleges and universities have already incorporated the game into their program plans. Starting today, over 2,000 universities around the world can download the game from IBM's website and begin using it in their classrooms. "The best kept secret in the world of computer and video games is the rise of a movement -- now in the thousands -- of gamers, universities and corporations dedicated to applying games to serious challenges such as education, training, medical treatment, or better government," said David Rejeski, director of the Serious Games Initiative which is housed at the Woodrow Wilson International Center for Scholars in Washington, D.C. "IBM has established itself as a pioneer in serious gaming by enabling universities to educate students using the gaming medium they understand, enjoy and embrace." IBM has created Innov8 as a new way to teach business students and young IT professionals -- many whom have grown up playing video games -- about competing successfully in business. Innov8 is an interactive, 3-D educational game designed to bridge the gap in understanding between IT teams and business leaders in an organization. 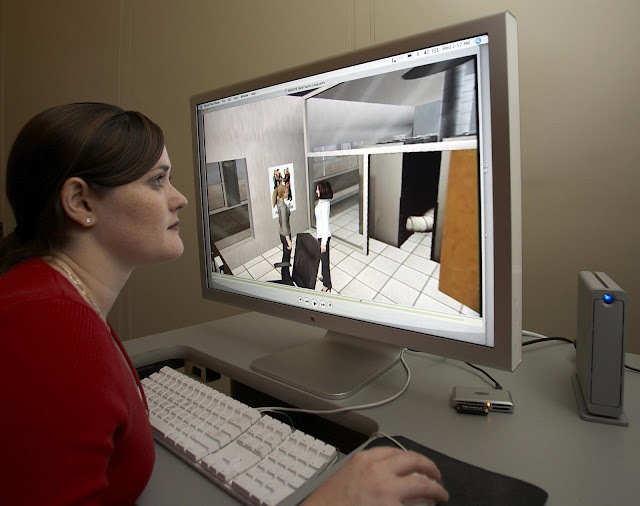 This type of serious gaming -- simulations which have the look and feel of a game but correspond to non-game events or processes such as business operations -- has emerged as a successful method to train employees or develop new skills. Most MBA programs are already heavily based on projects that reflect how individuals and teams need to interact in the real world. Innov8 takes that a step further by actually allowing students to step into a real, dynamic business environment. The game is based on advanced commercial gaming technologies and allows players to visualize how technology and related business strategies affect an organization's performance. Together, users can visualize business processes, identify bottlenecks, and explore 'what if' scenarios before the technology is deployed. Innov8 was designed to be delivered in a one hour learning lab to supplement courses like Business Process Management, Corporate Strategy, and Operations and IT Management. The idea for the game resulted from an annual IBM-sponsored competition among graduate business students at Duke University and the University of North Carolina. 75 percent of CEOs surveyed by IBM cited education and the lack of qualified candidates as the issues that will have the greatest impact on their business over the next three years. With a growing number of jobs and professions requiring a combination of technology and business skills, Innov8 can be an effective way of developing this new, hybrid skill set. A recent study also found that 56 percent of IBM customers cited lack of skills, mainly individuals with a blending of IT technical understanding and business process acumen, as the leading inhibitor to service oriented architecture (SOA), a $65 billion market opportunity. Innov8 will help students and young professionals develop these crucial skills. "IBM views serious gaming as a new and exciting way to develop the skills that are required as business and IT become more closely aligned," said Sandy Carter, vice president, IBM SOA and WebSphere strategy, channels and marketing. "Innov8 was designed to address this specific skills shortage while also helping universities realize the benefits of using serious games as a powerful tool for teaching today's students." Innov8 is now available through IBM's Academic Initiative, a program offering a wide range of technology education benefits to meet the goals of colleges and universities. As a member of this initiative, participating schools receive free access to IBM software, discounted hardware, course materials, training and curriculum development. Nearly 2,000 universities and 11,000 faculty members worldwide have joined IBM's Academic Initiative.